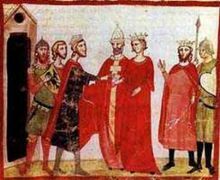 John of Brienne (c. 1170 – 27 March 1237), also known as John I, was King of Jerusalem from 1210 to 1225 and Latin Emperor of Constantinople from 1229 to 1237. He was the youngest son of Erard II of Brienne, a wealthy nobleman in Champagne. John, originally destined for an ecclesiastical career, became a knight and owned small estates in Champagne around 1200. After the death of his brother, Walter III, he ruled the County of Brienne on behalf of his minor nephew Walter IV (who lived in southern Italy). 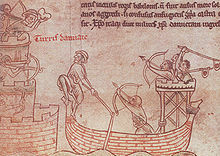 Frisian crusaders attack a tower near Damietta during the Fifth Crusade (from Matthew Paris' 13th-century Chronica Majora). After the Fifth Crusade ended "in colossal and irremediable failure", John returned to his kingdom. Merchants from Genoa and Pisa soon attacked each other in Acre, destroying a significant portion of the town. According to a Genoese chronicle, John supported the Pisans and the Genoese left Acre for Beirut. 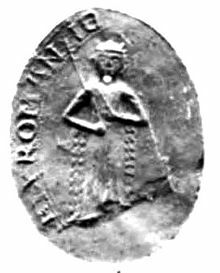 Seal of John's second daughter, Marie, Latin Empress; John was senior co-emperor of her husband, Baldwin II. John married his third wife, Berengaria of León, in 1224; she was born around 1204 to Alfonso IX of León and Berengaria of Castile. John and Berengaria's first child, Marie, was born in 1224. Their first son, Alphonse, was born during the late 1220s. 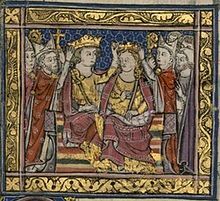 Berengaria's cousin, Louis IX of France, made him Grand Chamberlain of France and he acquired the County of Eu in France with his marriage. John's second son, Louis, was born around 1230. His youngest son, John, who was born in the early 1230s, was Grand Butler of France. ^ Buckley 1957, pp. 316–318. ^ Perry 2013, p. 16. ^ George Akropolites: The History (ch. 27. ), p. 184. ^ Buckley 1957, p. 315. ^ a b c Buckley 1957, p. 316. ^ a b c Runciman 1989, p. 132. ^ Buckley 1957, pp. 318–319. ^ Perry 2013, pp. 25–26. ^ Buckley 1957, p. 319. ^ a b c d Perry 2013, p. 26. ^ a b Perry 2013, p. 27. ^ Perry 2013, pp. 29–30. ^ Perry 2013, p. 24. ^ a b c Perry 2013, p. 29. ^ Perry 2013, p. 30. ^ Perry 2013, p. 33. ^ a b c Perry 2013, p. 35. ^ Perry 2013, p. 36. ^ a b c Perry 2013, p. 39. ^ a b c Perry 2013, p. 42. ^ Perry 2013, p. 47. ^ Perry 2013, pp. 47–48. ^ a b c d e f g Runciman 1989, p. 133. ^ Runciman 1989, pp. 103, 133. ^ a b c Perry 2013, p. 56. ^ Perry 2013, p. 55. ^ a b Perry 2013, p. 49. ^ a b c d Runciman 1989, p. 134. ^ a b Perry 2013, p. 68. ^ Perry 2013, pp. 68–70. ^ Perry 2013, p. 73. ^ Perry 2013, p. 74. ^ Perry 2013, pp. 70–71. ^ Perry 2013, p. 70. ^ a b c Perry 2013, p. 77. ^ Perry 2013, p. 78. ^ a b c Perry 2013, p. 79. ^ a b c Perry 2013, p. 80. ^ Perry 2013, p. 90. ^ Van Cleve 1969, pp. 378–379. ^ a b Runciman 1989, p. 147. ^ a b c d Runciman 1989, p. 148. ^ Van Cleve 1969, p. 389. ^ Perry 2013, p. 91. ^ Perry 2013, pp. 91–92. ^ Van Cleve 1969, p. 390. ^ Van Cleve 1969, pp. 391–392. ^ Perry 2013, p. 92. ^ Van Cleve 1969, p. 393. ^ Van Cleve 1969, p. 394. ^ Van Cleve 1969, p. 395. ^ Runciman 1989, p. 150. ^ a b Perry 2013, p. 99. ^ a b Van Cleve 1969, p. 398. ^ Perry 2013, pp. 99–100. ^ Van Cleve 1969, p. 397. ^ a b c d e f Van Cleve 1969, p. 404. ^ Van Cleve 1969, pp. 402–403. ^ Van Cleve 1969, p. 407. ^ a b c Runciman 1989, p. 159. ^ a b Runciman 1989, p. 161. ^ a b Perry 2013, p. 103. ^ Van Cleve 1969, p. 417. ^ a b Runciman 1989, p. 162. ^ Perry 2013, pp. 109–110. ^ a b Perry 2013, p. 109. ^ Perry 2013, p. 113. ^ Runciman 1989, p. 164. ^ Perry 2013, p. 112. ^ Perry 2013, p. 111. ^ Van Cleve 1969, p. 420. ^ a b Perry 2013, pp. 111–112. ^ a b c Runciman 1989, p. 165. ^ Perry 2013, pp. 114–115. ^ a b Perry 2013, p. 115. ^ Perry 2013, p. 116. ^ a b Runciman 1989, p. 166. ^ a b Van Cleve 1969, p. 424. ^ Perry 2013, p. 118. ^ Van Cleve 1969, pp. 425–426. ^ a b Runciman 1989, p. 169. ^ Van Cleve 1969, p. 428. ^ a b c d Perry 2013, p. 120. ^ a b c Perry 2013, p. 164. ^ Perry 2013, pp. 118–119. ^ a b Perry 2013, p. 121. ^ a b Runciman 1989, pp. 173–174. ^ a b Runciman 1989, p. 174. ^ Van Cleve 1969, p. 438. ^ a b Perry 2013, p. 124. ^ a b c Perry 2013, p. 127. ^ Perry 2013, pp. 128–129. ^ Perry 2013, p. 128. ^ a b Perry 2013, p. 129. ^ a b c d e Bianchini 2012, p. 186. ^ Perry 2013, pp. 130–131. ^ a b c Perry 2013, p. 125. ^ Van Cleve 1969, p. 443. ^ a b c d Perry 2013, p. 135. ^ Runciman 1989, p. 176. ^ Perry 2013, p. 136. ^ Perry 2013, p. 139. ^ a b c Perry 2013, p. 140. ^ Perry 2013, p. 141. ^ Perry 2013, p. 142. ^ Runciman 1989, p. 177. ^ a b Perry 2013, p. 143. ^ Van Cleve 1969, p. 447. ^ Van Cleve 1969, p. 446. ^ a b Perry 2013, p. 145. ^ Perry 2013, pp. 145, 147. ^ a b c d e Perry 2013, p. 147. ^ a b Lock 1995, p. 62. ^ a b Perry 2013, p. 150. ^ a b c d Lock 1995, p. 63. ^ a b c Perry 2013, p. 151. ^ Perry 2013, p. 148. ^ Runciman 1989, p. 189. ^ Perry 2013, pp. 148–149. ^ a b Perry 2013, p. 152. ^ a b Perry 2013, p. 153. ^ Perry 2013, p. 154. ^ Perry 2013, p. 155. ^ Perry 2013, p. 156. ^ a b c Perry 2013, p. 162. ^ a b Lock 1995, p. 65. ^ a b Perry 2013, p. 166. ^ a b Perry 2013, p. 172. ^ Treadgold 1997, p. 723. ^ Perry 2013, p. 173. ^ Perry 2013, p. 161. ^ a b Treadgold 1997, p. 724. ^ Perry 2013, p. 174. ^ a b Perry 2013, p. 175. ^ a b c Perry 2013, p. 176. ^ Perry 2013, p. 179. ^ Perry 2013, p. 177. ^ Perry 2013, p. 180. ^ Perry 2013, p. 181. ^ a b Perry 2013, p. 182. ^ a b Perry 2013, p. 183. ^ Perry 2013, p. 183–185. ^ Runciman 1989, pp. 30–32. ^ Runciman 1989, p. 104. ^ Runciman 1989, p. 87, Appendix III (genealogical trees 2 and 4). ^ Bianchini 2012, p. 188. ^ Perry 2013, p. 130. ^ Bianchini 2012, p. 187. ^ Perry 2013, p. 165. ^ Perry 2013, pp. 164–165. George Akropolites: The History (Translated with an Introduction and Commentary by Ruth Mackrides) (2007). Oxford University Press. ISBN 978-0-19-921067-1. Bianchini, Janna (2012). The Queen's Hand: Power and Authority in the Reign of Berenguela of Castile. University of Pennsylvania Press. ISBN 978-0-8122-4433-5. Buckley, James Michael (April 1957). "The Problematical Octogenarianism of John of Brienne". Speculum. The University of Chicago Press. 32 (2): 315–322. doi:10.2307/2849122. JSTOR 2849122. Perry, Guy (2013). John of Brienne: King of Jerusalem, Emperor of Constantinople, c. 1175–1237. Cambridge University Press. ISBN 978-1-107-04310-7. Runciman, Steven (1989). A History of the Crusades, Volume III: The Kingdom of Acre and the Later Crusades. Cambridge University Press. ISBN 0-521-06163-6. Van Cleve, Thomas C. (1969). "The Fifth Crusade; The Crusade of Frederick II". In Setton, Kenneth M.; Wolff, Robert Lee; Hazard, Harry. A History of the Crusades, Volume II: The Later Crusades, 1189–1311. The University of Wisconsin Press. pp. 377–462. ISBN 0-299-04844-6. Wikimedia Commons has media related to John of Brienne. Cawley, Charles (30 June 2015). "Medieval Lands: A prosopography of medieval European noble and royal families, Jerusalem, kings, chapter 1E: Kings of Jerusalem 1210–1220 (Comtes de Brienne)". Foundation for Medieval Genealogy. Retrieved 24 March 2016.